Having Siri on is a prerequisite to using the Dictation functionality on your phone. You have a few ways to call Siri into action. The traditional way is to press and hold down the Home button until you hear a tone. Pretty simple, eh? The question, “What can I help you with?” appears on the screen. You can start talking. 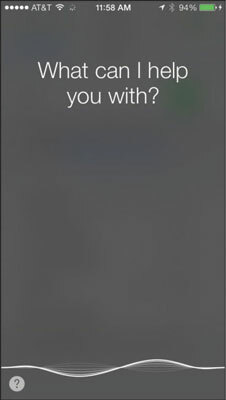 An iOS 8 feature lets you summon Siri by merely saying, “Hey Siri.” And yes, this is Apple’s answer to the “OK Google” voice command on Android phones. However, you have to connect your phone to power to take advantage of the “Hey Siri” feature. On handsets without iOS 8, you can bring the phone up to your ear, wait for a tone, and then talk. Siri responds also when you press a button on a Bluetooth headset. For this to work, the Raise to Speak feature must be enabled inside Siri’s settings. What happens next is up to you. You can ask a wide range of questions or issue voice commands. If you didn’t get your words out fast enough or you were misunderstood, tap the microphone icon and try again. Siri relies on voice recognition, artificial intelligence, and, of course, an Internet connection. She (or he) will respond in a conversational (if still slightly robotic) manner. But using Siri isn’t entirely a hands-free experience. Spoken words are supplemented by information on the iPhone screen. And just where does Siri get that information? By tapping into Location Services and seeking answers from the web using sources such as Bing, Wikipedia, Yelp, Yahoo!, Open Table, Twitter, and WolframAlpha, which you can learn more about in the coming sidebar. And Siri can also open apps, Apple’s own as well as third-party apps. You might ask, “How do I get home from here?” and Siri will fire up Maps to help you on your way. Or you can ask, “Find a good Italian restaurant near Barbara’s house,” and Siri will serve up a list, sorted by Yelp rating. Siri can even let you make a reservation (via Open Table). It’s pretty darn cool that Siri now teams up with a great new, Shazam, to identify the name and artist of the musical track that’s playing. Just ask Siri what song is playing and she’ll tell you (assuming that she can identify the song). When the song is properly identified, you even get a chance to buy it. Siri requires Internet access. In addition, many factors go into its accuracy, including surrounding noises and unfamiliar accents.